After a pretty long time here I am back with my favorite brand. Yes, you guessed right. 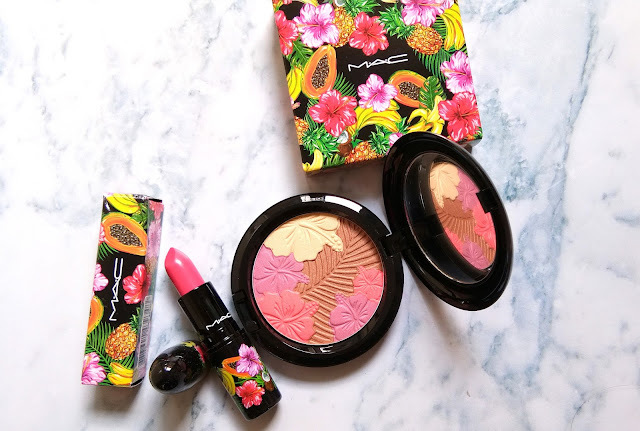 Today I am going to share my reviews, swatches over the newly launched MAC FRUITY JUICY COLLECTION. The collection launched in India on 10th July 2017. The collection has loads of products among which I picked up two products. 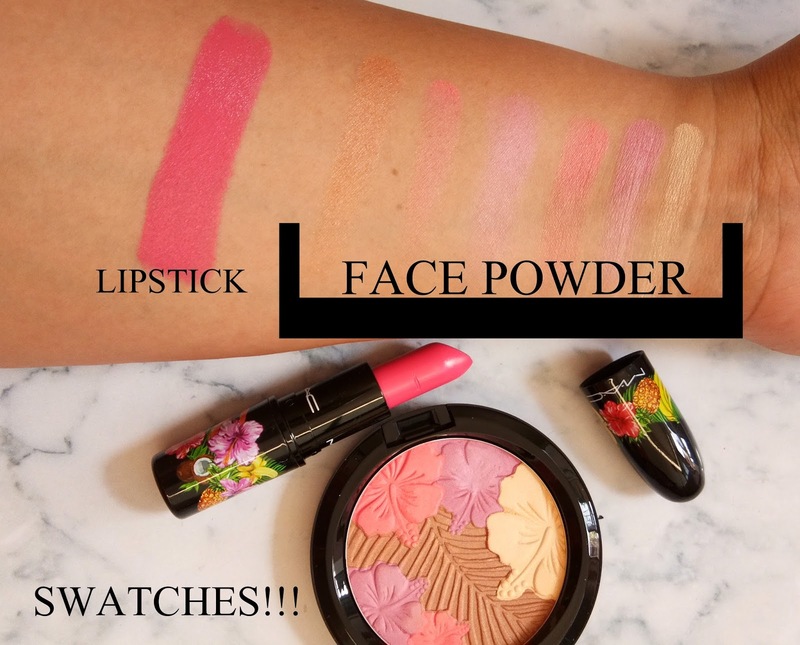 They are a lipstick "LOVE AT FIRST BIT" (lol...funny, I know) and a pearlmatte face powder "OH MY PASSION!". The price of the lipstick:- $17(as I bought from abroad, so don't know the exact price in Indian currency)for 3g of lipstick. The price of Pearlmatte face powder: - Rs.2990/- for 8g of the product. Mac online website (the lipstick is oos everywhere), Mac stores. Shake up the summer with a frootilicious collection of sun-kissed succulence. Take a sweet vacation of tropical color for lips and eyes, including the online-exclusive Eye Shadow x 6: Oh My Banana. Featuring special packaging throughout! Love at first bite. MAC FRUITY JUICY COLLECTION is known for its packing firstly. The colorful packaging of this collection is the main attraction. 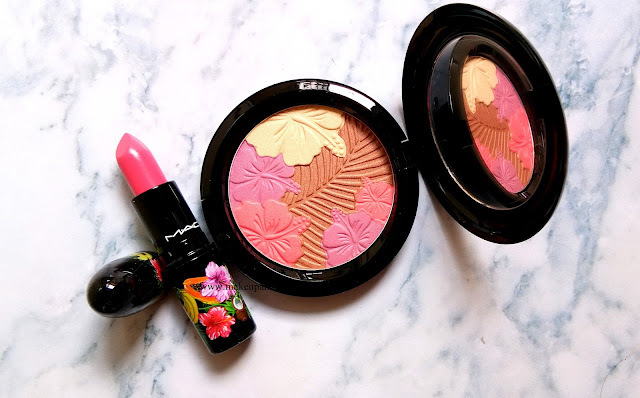 Both the lipstick and the face powder comes in a beautiful black case with special packaging with tropical fruit and floral print. The lipstick open with a twist up the pattern. The face powder comes with a mirror only. The face powder is really beautiful. The first day I saw the sneak peak of this collection I decided that I want this face powder badly in my life. The outer packaging, the self-design face powder itself is so pretty that I hardly had any reason to skip it. Mac oh my passion! face powder described by Mac as a face powder with pearlized and satin shades for highlighting and blush effects. 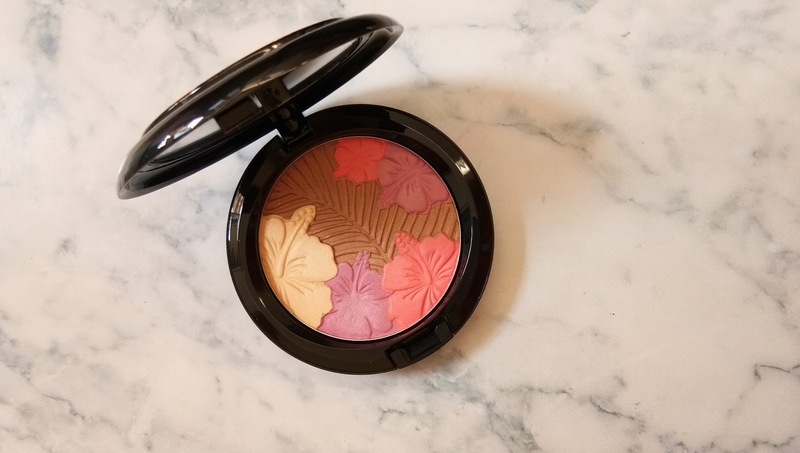 "A unique face powder featuring a flirty flower pattern pressed into it. Pearlized and satin shades feature a rich texture, velvet finish. Can be used as a blush and highlighter. (Also suitable for the eye area.) Limited edition. Special packaging with tropical fruit and floral print." Use a large brush over the face for light application. Use a small brush or sponge on eyelids and brow bones as a highlight. I bought the face powder from Mac store. The face powder has a floral design on it which consists of a pink, a coral, a yellow flower and a brown leafy like structure. 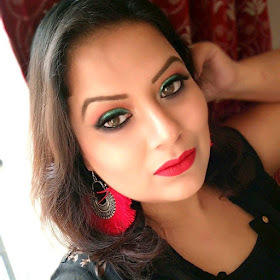 The face powder when swirling with a big blush on all the color of the pan it together creates a beautiful pinkish coral shade which is just perfect for Indian skin tone. 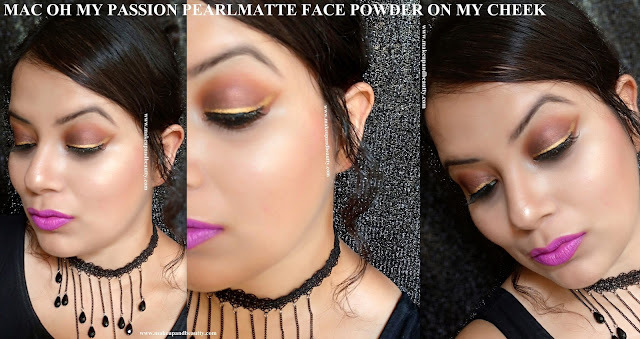 The face powder is matte in texture but has subtle shimmer on it and so when ever you applied it on your skin you will get a nice natural glow on skin. Although the face powder considered as a highlighter by Mac I personally love to use it as Blush or as eyeshadow. It stays pretty 7 hours or more on my skin. Overall this one is my favorite in this collection. A Lipstick in lip-smacking beige, fuchsia and violet shades. Go bananas in lip-smacking beige, fuchsia and violet Lipsticks. Four shades, four textures. Among the four lipstick that launched in this collection, I picked up the shade "LOVE AT FIRST BITE", It is an amplified one in texture. The lipstick is a beautiful warm pink shade with a cream finish. It glides super smoothly on lips. But as it an amplified finish so it has a tendency to melt during summer. 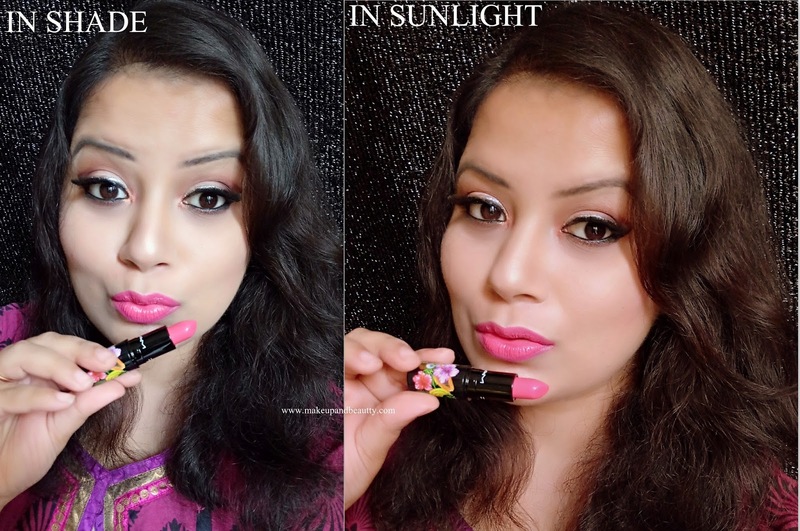 These lipsticks are perfect for winters. The lipstick neither moisturises the lips nor hydrates it. It stays comfortable on lips for 3-4 hours (if we have heavy oily food in between ). With a lip liner as a base, it stays pretty 6 hours on my lips. One or two swipe is enough to get the color on lips because if you apply more you might feel heavy on lips. Overall I am kind of love and hate the lipstick. Finally few more pictures of the products. Here are two looks that I created using the face powder and the lipstick.